Need to create sales or marketing reports for managers, board members, or executives? We've got you covered with our executive report template. Executives only want to know the important facts. Our executive report templates include the key information that senior management will want to know. You can easily share the report with your management team and chief executive officer. You can also easily create annual reports using the annual report template and generate concise reports for business plans. Creating executive reports doesn't need to be time consuming or complicated. Use our executive summary templates to create beautiful status reports that give your management team the main points they need to know. Include the total cost of marketing campaigns in your executive reports. You can pull data from Google Adwords and social media sites to create custom expense reports. If there's one thing senior management wants to know it's the bottom line. 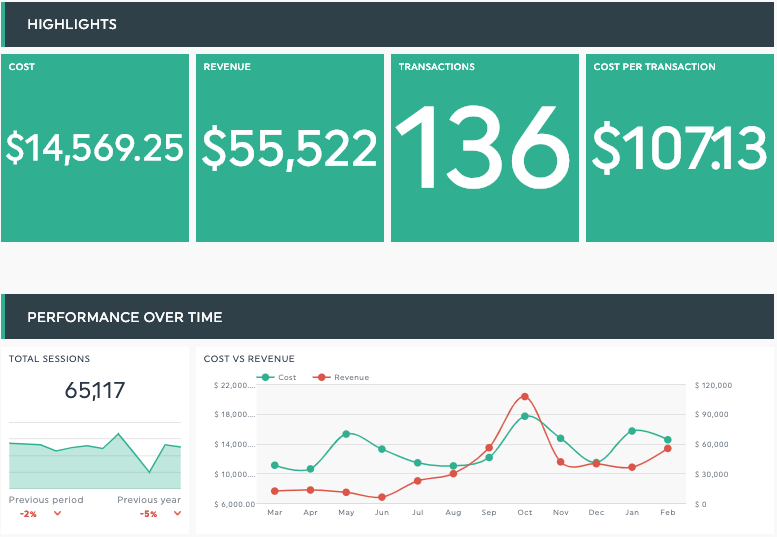 Our reports let you easily track and report on total sales revenue. Management will want to know whether their investments in marketing campaigns are paying off. Show them the value of all your hard work. 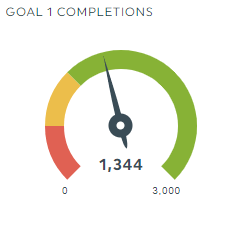 Goal completions tell you how many times a predetermined objective on your website has been met. Whether it's purchases or sign-ups, you'll be able to keep management informed. Say goodbye to Google Docs and Excel spreadsheets. Our executive report templates will save you time and let you focus on doing what you do best. It's quick and easy to get started. Just follow this step-by-step guide. Select the digital tools you want to pull data from and we'll do the rest. Choose Business Executive Report template from the drop-down menu and you're all set. Want to show data from different platforms in one report? No problem! DashThis can automatically pull data from more than 34 platforms into one report. Automate your executive reporting process with DashThis! Creating reports in Google Docs or Microsoft Excel takes too much time. 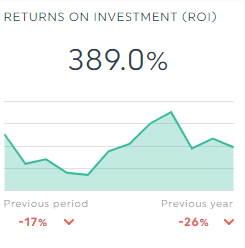 Why bother when you can get a beautiful custom report and save time in the process? You can even add an executive summary to your reports to give your management team a quick overview. Our effective executive report template is fully customizable so you can present your report just how you want it. You can add specific findings and important points to highlight the key takeaways and an executive summary or project status report at the beginning for quick overview. Choose how you want to share your executive report with senior management. You can choose different file formats (email, PDF format or live URL) and use automated email dispatch so your chief executive officer or directors of specific departments get the report file or URL when you want them to. Create a custom URL or a custom design (or both!) for your executive reports. Ever heard the phrase 'dress for success'? The same thing applies to reports: the better it looks the more impact it will have. With DashThis, your reports can reflect your company's branding, colours, fonts, and general vibe so your reports will always look top-notch. No matter what kind of executive report you want to create, we've got you covered. Creating annual reports for senior management can be a time-consuming job. It's an important one, though, because it helps management decide on future plans. Let us make it easy for you. Create your own annual executive report! Quarterly status overviews are a breeze with our status report templates. Marketing and sales reports for every quarter are some of the most common reports, so why not make it as painless as possible with DashThis? Create your own quarterly executive report! Create monthly executive status reports that are easy to digest and gives management exactly what they need to know using our monthly report template. Don't spend the last few days of the month collating data in Excel. Use DashThis instead. Create your own monthly executive report! Easily generate weekly reports using our executive report templates. Since DashThis fetches your sales and marketing data automatically, you'll be able to create weekly reports in no time at all. Create your own weekly executive report! Want to create other reports so you can track your digital marketing campaigns? Here are just a few of the reports you can create using DashThis. Automatically generate PPC reports. Our PPC report templates can fetch data from all the web platforms you're using. Track a range of digital marketing efforts (such as social media, website presence and email campaigns) and your KPIs using our digital marketing report template. Create custom SEO reports so you can track you search engine optimization analytics and keyword rankings.